Will The FTC Investigate People & Companies Paid By Facebook To Use Facebook Live? Every time this case has come up (and it's been bouncing around the courts for a while now), I've been meaning to write about it, but am only just getting around to it now that organizations are filing amici briefs with the Supreme Court. The case is Star Athletica v. Varsity Brands, and it sounds kind of stupid: the issue is that both companies make cheerleading uniforms, and Varsity Brands accused Star of copying its uniform designs. Star argued that as a "useful article" a cheerleading uniform is not subject to copyright protection, and it won at the district court level. The 6th Circuit, however, reversed that ruling about a year ago, saying that while the uniform design may not be copyrightable, elements within the design (stripes, zigzags, chevrons, etc.) could be. This is problematic for a variety of reasons. Clothing and fashion have never been considered covered by copyright for many good reasons, and it's actually helped create a more innovative, more competitive, thriving market for fashion. There's a reason why copyright is not allowed on "useful articles," and it's worked. We shouldn't suddenly be changing those rules now. The Supreme Court has agreed to hear the case, and various amici have begun filing their briefs. You can also see Star Athletica's own filing as well, which focuses (as it should) on the narrow technical question regarding "separability" and whether or not you can "separate" the design that's being claimed for copyright from the article itself. That is, you could argue that a square painting done on a T-shirt could be "separable" from the T-shirt and thus get a copyright, while the T-shirt itself could not. Here, however, we're talking about basic elements of a cheerleading uniform such as stripes and color patterns that help identify it as a cheerleading uniform. What does this have to do with copyright law on cheerleading uniforms? Well, the 3D printing space involves plenty of sharing of designs and people building on the work of others. And this includes decorative elements. Allowing those to be carved out and covered by copyright separately could have a massive chilling effect on the community creating useful 3D printed objects. The depth of creativity of consumers is revealed in the range of 3D printed products: jewelry, shower heads, and lawnmowers, to name a few. 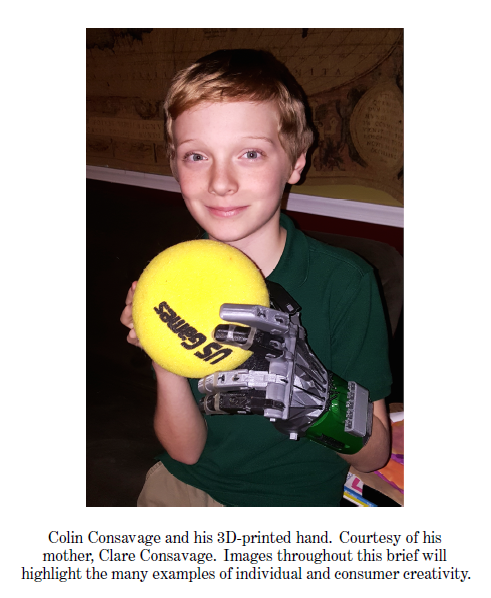 Colin Consavage, the boy who 3D-printed a plastic hand, exemplifies this creativity.... Seeking “payback time” for his naturally smaller left hand, he designed his mechanical prosthetic extra large. He now hopes to add features like a screwdriver finger, a laser pointer, and plastic that changes color with temperature. Consumer-driven 3D printing is creative, innovative, and greatly dependent on copying and derivation to which copyright may be the gatekeeper. Many 3Dprinted products, like Colin’s plastic hand, are primarily utilitarian but involve aesthetic elements. Sharing of useful 3D designs, and the productive consumer output that results from that sharing and innovation, could be thwarted by an overbroad rule of copyright. The filing notes that this is only going to become a bigger and bigger issue as the tools for production are getting distributed worldwide now, and more and more people are creating stuff themselves. Should articles such as clothing, costumes, and 3Dprinted prosthetics become more subject to copyright in their appearances, that would not only increase the risk of liability for home-grown creators; it would send a message to those creators that they are less welcome at the table of creativity than those who can ante up the price and transaction costs of copyright licenses. That message contravenes the purpose of copyright law, namely “to promote the progress of science and useful arts.” U.S. Const. art. I, § 8, cl. 8. To better serve that constitutional purpose, the role of copyright in useful articles ought to remain limited. There's a lot of other good stuff in that brief, and it does an excellent job detailing just how important this case can be beyond just something as simple as "cheerleading uniforms." Give the kid a hand. Pound keyboard .. type something ignorant.